[0.1] In Schumann’s Kreisleriana, I actually hear no note, no theme, no contour, no grammar, no meaning, nothing which would permit me to reconstruct an intelligible structure of the work. No, what I hear are blows: I hear what beats in the body, what beats the body, or better: I hear this body that beats. [0.2] Interpretation is then merely the power to read the anagrams of the Schumannian text, to reveal the network of accents beneath the tonal, rhythmic, melodic rhetoric. The accent is the music’s truth, in relation to which all interpretation declares itself. [1.1] In his new book, Fantasy Pieces: Metrical Dissonance in the Music of Robert Schumann, Harald Krebs has put his finger on the pulse of Schumann’s rhythm, sensitizing us to a world of rhythmic sensations that theorists normally ignore. And what brings his ideas even more to life is the extraordinary style of presentation Krebs has chosen. [1.3] At first, Krebs seems to be taking a lighter turn on the age-old tradition of writing a theory treatise in dialogue. However, a painful insight into Robert intrudes when we realize that this is really a fantasy within a fiction; indeed the moment of revelation, seen through the eyes of the sympathetically rendered Clara, is one that I found genuinely moving. Further, Krebs gradually makes clear that psychological insight is not irrelevant to his very substantial and wide-ranging musical exegesis. [2.2] Note that the label G 3/2 designates a two-against-three in the opposite of the usual manner. Though this takes getting used to, on the whole, Krebs’s system is a clear and elegant method of labeling a wide variety of rhythmic conflicts. (A glossary is included as well.) Knowing that these labels could be applied ubiquitously, Krebs is careful to gauge the contextual strength of dissonances; thus, the “3s” in parentheses in Example 1 designate a weaker layer that is heard only because of the collision of accents in measure 27. [2.3] Also important is that these dissonances can be indirect or subliminal (terms that overlap somewhat), understood because the conflicting layer, although absent, may be retained or inferred by listener. 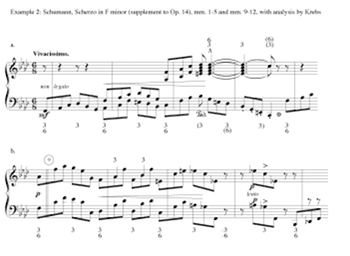 One of Schumann’s more extreme pieces is excerpted in Example 2; Krebs convincingly argues that the notated meter is to be heard as referential, even if not at first explicitly expressed (203–9; Examples 8.16 and 8.17A). I wholeheartedly agree that this sort of notation is not meaningless idiosyncrasy, but is meant to be heard as subliminal dissonance, a kind of unconscious contortion of a more relaxed posture. Indeed, the descriptions of how these and other metrical dissonances are to be heard, and the advice on how they are to be realized in performance are among the best I have read. [2.6] Among the most valuable contributions of this book are the many citations of compositional revisions by Schumann. These lay to rest any question of intentional fallacy: the concern for careful manipulation of rhythm is indisputable, and Krebs persuasively details myriad reasons why Schumann increased—or sometimes decreased—the level of dissonance. (5) He also addresses questions of form, of text expression, and, perhaps most important, of extramusical significance. Because of its direct connection with our sense of bodily experience, rhythm and meter can seem particularly rich with meaning, a topic which Krebs does not exhaust. (6) Also quite fascinating, he alludes frequently to a connection between Schumann’s pervasive dissonance and his precarious mental condition (and hence, to the book’s fictional conceit). [2.7] A lengthy Carnaval des analyses ranges widely from Berlioz to Schoenberg. The book’s epilogue is a virtuosic translation of a metrical map of the late Morning Song (#3) into words, as a dissonant and quasi-simultaneous dialogue alluding to many song texts. Like much modernist literature, it approaches the abstract condition of music, but also, perhaps unintentionally, shows how different the experience of verbal and musical content can be. [3.1] Krebs claims that he could have written this book about any number of composers, but I doubt that even a study of Beethoven or Brahms would yield such a convincing demonstration of the aesthetic power of metrical dissonance. (This is especially because, in contrast to Beethoven, Schumann’s hypermetric groupings are usually quite regular.) Piece after piece demonstrate Schumann’s obsession with infusing his music with ever more imaginative metrical imbroglios. (And even after referencing well over a hundred movements by Schumann, Krebs is far from running out of examples.) However, the fact that this book issues from a study of a single composer in no way minimizes its generality as a treatise on meter. It can be the function of a truly creative composer to expand our modes of hearing, and the way we conceptualize them, even a century-and-a-half later. [3.2] And some may find this concept of meter, at times a dizzying array of conflicting layers, challenging, to say the least. This is especially true of those who strictly separate rhythm and meter, placing Krebs’s “metrical” dissonances in the realm of rhythms that freely dance around a fixed metrical grid. Krebs is not alone in rethinking that separation. (7) And while I tend toward a more traditional view of meter, I find something intuitively inclusive about Krebs’s metrical states. Think of what untrained listeners mean when they speak of various pop styles having a certain kind of “beat.” They don’t mean that the metric grid is different (almost invariably a strict quadruple), but rather that the meter is colored by characteristic and recurring rhythmic patterns, often “dissonant” syncopations and groupings, that the listener assumes as inseparable from the underlying pulse. I don’t know why imaginative art music could not be understood in a correspondingly more sophisticated way. [3.4] The independence of strata in Figure 1a suggests another issue: Krebs does not usually address the extent to which a dissonant layer is fully metric, in the sense of having at least the potential for a nested metric hierarchy (in the conventional interlocking grid). These layers are often determined by accents, but accents are not necessarily generators of meter (to me, at least). An interpretive layer may assert itself by simple reiteration. (In a way, Krebs’s special definition of meter allows him to neatly sidestep the issue.) Still, Example 2, which begins with a subliminally dissonant state, obviously shows some degree of metrical reinforcement within the dissonant layers (i.e., two 3s within each 6; is this not really one dissonance?). Returning to Example 3, my own analysis suggests that the dissonant upper-voice layer, indicated by the beams displaced forward one sixteenth, has a strong potential to form its own nested hierarchy based on the pairing of accented dissonances with their resolutions in the first bar; in the second bar, double neighbors generate four-eighth-note groups. (Here 1 = sixteenth; the first bar can even express an 8-layer if the performer chooses to express the displaced beaming.) At first the notated meter is expressed only at the measure level (the 16-layer); faster harmonic changes in succeeding bars allow the metric level to accrue more subdivided levels, and to be heard more clearly. Perhaps attention to this sort of potential for hierarchy among competing levels could serve as one possible criterion for measuring the perceptual strength of incommensurable layers. [4.1] Krebs has presented us with a labeling system of admirable simplicity. Still, there are times when I wish it were a bit messier. 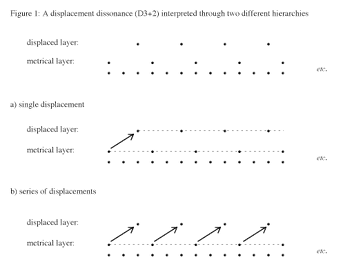 For instance, Krebs notes that displacement dissonance can be heard as “forward” (as suggested in Figure 1) or “backward” (35); in practice, however, he nearly always defaults to forward displacements, or simply gives both labels (e.g., as in fn. 8). But surely this distinction is sometimes quite clear; I cannot imagine Example 2 as anything but a backwards displacement. Krebs calls it D6+5 and D3+2 (203); the labels D6-1 and D3-1 would not only be truer, but would be more obviously related. Even in less straightforward situations, I would find Krebs’s interpretive distinction valuable. [4.2] Grouping and displacement are always labeled separately, even though there are cases where the two are in essence the same dissonance. In Brahms’s Intermezzo, Op. 116, No. 7, the middle section (measures 21–46) weaves through its imaginative texture a hemiola with the 2-layer displaced one eighth. Perhaps a hybrid label such as G3+2(D+1) would capture both aspects at once. [4.3] Krebs’s layers are in principle regular, but perhaps it could be useful to define some layers as irregular, in the manner of additive rhythms. In Kreisleriana, No. 3, the first four bars, right hand, can parse as 6+6+4 (counting eighths), which is dissonant against the left hand’s 8+8. [4.4] Though metrical processes are an important part of the analyses, the labeling system lends itself less well to highlighting more fluid and occasional mutations of metrical dissonances. In Example 4 (discussed further below), the offbeat sforzando C3 in measure 87 is surely an elongation of the offbeat sixteenths (through abrupt backward displacement). Though this situation recurs in measure 91, it does not seem to me to be a separate layer, but rather an alteration within the existing layer. [4.5] Finally, I am not sure that Krebs’s labels fully capture the really jarring effect of Example 2, the abrupt suppression of one metric state by another in measure 3, and the disruptive effect of the lento redisplacement of motivic material in measure 12. These are moments that seem intent on shattering the continuity of meter itself. [5.1] Any theory highlights some aspects of music and downplays others. Some readers of this book may feel the lack of a real relationship between metrical dissonance and tonal structure (though, to be sure, Krebs shares some fine insights into a handful of pieces). The danger is that metrical dissonance, usually slighted to begin with, might be seen as a kind of underground alternative to the legitimate world of tonal theory. [5.2] This would be a mistake. At the very least, awareness of metrically dissonant layers can sensitize us to voice-leading readings that we might otherwise miss. A less-than-obvious analysis from Schenker is overlaid onto Example 4. The F-major middle section of the piece is characterized by a persistent sixteenth-note anticipation in the left hand. In measure 87 there is a parenthetical interjection of a motive from the opening F-minor section. Rather than reading this as a root-position F-minor triad, Schenker understands the displaced bass note C3 as the functioning bass (and correspondingly in measure 91). (9) Here, the metrically dissonant layer is the superior one in tonal structure (and would be regardless of how the passage were pedaled). [5.3] Still, there are aspects of rhythmic/tonal flexibility that I wish could be included in Krebs’s concept of meter. The work excerpted in Example 5 receives insightful analysis of its rhythmic structure (197–8; Example 8.11), but there is added richness in the way in which this interacts with the motivic enlargement shown in measures 1–2 and the following agitated delaying of the Kopfton. In the fourth of this set of Intermezzi, there is a miraculous linkage between the first section in A minor and the middle part in E major, shown in Example 6: an almost identical pattern of chords undergoes a near reversal of harmonic function. This surely has a dramatic effect on its rhythmic impression; it would be desirable to find a way to integrate this into an analysis of metric dissonance. [6.1] The preceding thoughts are not to be taken as criticism. If I have been moved to voice them, it is only because Krebs’s book is so successful in rendering vital and vivid the visceral effect of Schumann’s rhythmic fantasy. What I find most exciting about this book is its enthusiasm for embracing the possibilities of complex metrical states. While on the one hand, I would hope that no serious theorist will be put off by the presence of Florestan and Eusebius in this book, I would on the other hand hope that the admirably efficient labeling system does not create the impression that all rhythmic effects have been precisely captured. I am sure that Krebs knows that it will take more to tame that beast (if that is even desirable!). Nonetheless, Fantasy Pieces is a work of remarkable insight into the metrical body that beats within Schumann’s music, and into the mind that conceived it. 1. From the essay, Rasch, reprinted in The Responsibility of Forms: Critical Essays on Music, Art, and Representation, trans. by Richard Howard (Berkeley and Los Angeles: University of California Press, 1999), pages 299, 303. 2. Maury Yeston, The Stratification of Musical Rhythm (New Haven: Yale University Press, 1976). Kreb’s first work on this method was presented in “Some Extensions of the Concepts of Metrical Consonance and Dissonance,” Journal of Music Theory 31 (1987) 99–120. 3. Example 1 is a conflation of Example 2.7 (33) and Example 3b from “Robert Schumann’s Metrical Revisions,” Music Theory Spectrum 19/1 (Spring 1997), 41; this article is also a fine brief introduction to the system. The labels to the right were included in the article, but unfortunately are omitted from examples in the book. 4. The terms “grouping” and “displacement” dissonance, which replaced the more opaque terms “Types A and B,” were coined by Peter Kaminsky in “Aspects of Harmony, Rhythm and Form in Schumann’s Papillons, Carnaval, and Davidsbuendlertaenze,” Ph.D. dissertation, University of Rochester (1989) 27. 5. See the article cited in footnote 2. 6. One meaning of metrical dissonance not emphasized by Krebs is inherent by the idea of displacement itself—that of spatial separation. A strikingly suggestive example is found in #8 of the Noveletten, Op. 21; in the second Trio, a melody marked “Stimme aus der Ferne,” a quotation from Clara Schumann’s Notturno (#2 from the Soirees musicales, Op. 6), is subsequently restated in the next section (labelled “Forsetzung”) in a freely displaced manner that gradually floats closer to metrical alignment. Another reference to distance is implied in the Eichendorff text set as the second of Schumann’s Op. 39 cycle (alluded to in the epilogue; 251). An image held in the speaker’s heart stands in for an absent beloved; Schumann’s setting, an essay in displacement on many levels, features an offbeat accompaniment that portrays both a beating heart and the distance it longs to bridge. 7. See, for instance, John Roeder’s review in Music Theory Online 4.4 (1998) of Christopher Hasty’s Meter as Rhythm (New York: Oxford University Press, 1997). Roeder has taken an approach related to Krebs in “Interacting Pulse Streams in Schoenberg’s Atonal Polyphony,” Music Theory Spectrum 16/2 (Fall 1994): 231–49. 8. One such example is the recurrence of a quarter-note upbeat beginning the four-bar groups in Grillen from the Phantasiestuecke, Op. 12 (measures 17–24 and corresponding places), which Krebs labels D12+11, or D12-1 (148). 9. The example illustrates the neighbor figure 3-4-4-3; Free Composition, trans. and ed. Ernst Oster (New York: Longman, 1979), 73 and Figure 80, 1. From the essay, Rasch, reprinted in The Responsibility of Forms: Critical Essays on Music, Art, and Representation, trans. by Richard Howard (Berkeley and Los Angeles: University of California Press, 1999), pages 299, 303. Maury Yeston, The Stratification of Musical Rhythm (New Haven: Yale University Press, 1976). Kreb’s first work on this method was presented in “Some Extensions of the Concepts of Metrical Consonance and Dissonance,” Journal of Music Theory 31 (1987) 99–120. Example 1 is a conflation of Example 2.7 (33) and Example 3b from “Robert Schumann’s Metrical Revisions,” Music Theory Spectrum 19/1 (Spring 1997), 41; this article is also a fine brief introduction to the system. The labels to the right were included in the article, but unfortunately are omitted from examples in the book. The terms “grouping” and “displacement” dissonance, which replaced the more opaque terms “Types A and B,” were coined by Peter Kaminsky in “Aspects of Harmony, Rhythm and Form in Schumann’s Papillons, Carnaval, and Davidsbuendlertaenze,” Ph.D. dissertation, University of Rochester (1989) 27. See the article cited in footnote 2. One meaning of metrical dissonance not emphasized by Krebs is inherent by the idea of displacement itself—that of spatial separation. A strikingly suggestive example is found in #8 of the Noveletten, Op. 21; in the second Trio, a melody marked “Stimme aus der Ferne,” a quotation from Clara Schumann’s Notturno (#2 from the Soirees musicales, Op. 6), is subsequently restated in the next section (labelled “Forsetzung”) in a freely displaced manner that gradually floats closer to metrical alignment. Another reference to distance is implied in the Eichendorff text set as the second of Schumann’s Op. 39 cycle (alluded to in the epilogue; 251). An image held in the speaker’s heart stands in for an absent beloved; Schumann’s setting, an essay in displacement on many levels, features an offbeat accompaniment that portrays both a beating heart and the distance it longs to bridge. See, for instance, John Roeder’s review in Music Theory Online 4.4 (1998) of Christopher Hasty’s Meter as Rhythm (New York: Oxford University Press, 1997). Roeder has taken an approach related to Krebs in “Interacting Pulse Streams in Schoenberg’s Atonal Polyphony,” Music Theory Spectrum 16/2 (Fall 1994): 231–49. One such example is the recurrence of a quarter-note upbeat beginning the four-bar groups in Grillen from the Phantasiestuecke, Op. 12 (measures 17–24 and corresponding places), which Krebs labels D12+11, or D12-1 (148). The example illustrates the neighbor figure 3-4-4-3; Free Composition, trans. and ed. Ernst Oster (New York: Longman, 1979), 73 and Figure 80, 1.